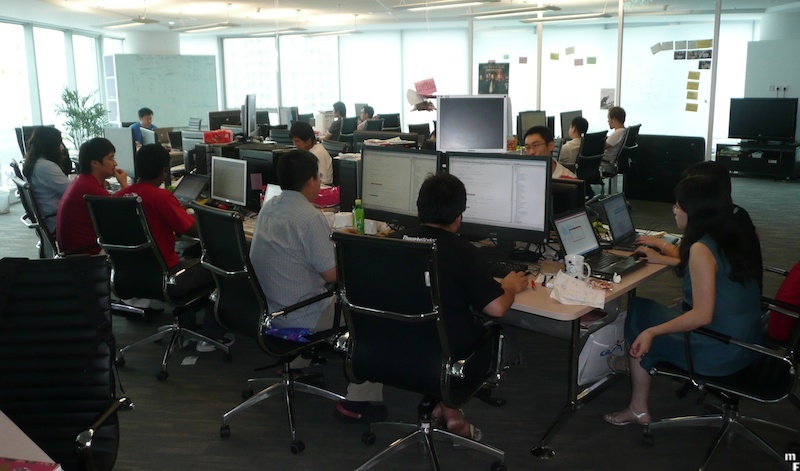 A common thing you find in agile projects is that the development team sits in a single open team room. It was advocated early on in Extreme Programming and called out as one of primary practices in the second edition. Agilists favor a open team room as it promotes lots of informal and deep communication between people on the team. Software development is an intense exercise in collaboration. An open space encourages regular conversations and interactions between people. You can see what everyone's doing and easily ask for help when you need to. Often you get serendipitous communication, where you overhear something that's really useful. Hearing this, some people are concerned about noise, and would prefer private offices. In practice I find that teams don't find noise to be a serious issue. There's usually a hum of conversation going on, after all pair programming often accompanies this style of development. But the conversation isn't usually that distracting, particularly as you're focused on the conversation with your pair. I suspect the reason it's not that distracting is because the team has a common purpose around a collaborative activity. It isn't comparable to an open-plan office where everyone is doing something different. First make sure it is the right size for the team. While a team room should be open within itself, it should be closed to everyone else. In an ideal world you'd like flexible walls that can insulate one team from another, so an office consists of pods of teams. This is hard to do in practice. Our offices tend to be completely open, with little barriers between teams. This seems to work well-enough, although there are some complaints about the inter-team noise. Pay attention to natural light. Humans are used to seeing the outside world, and all sorts of natural rhythms work off of light. So it's no surprise that people get very cranky if there isn't enough light about. I've spent plenty of days in enclosed conference rooms, and it certainly wears down my energy. Provide enough space: about 50 square feet per person (4.5 square meters for those on metric). With the right kind of space the next key thing is to ensure that the team has control over that space. An important part of agile thinking is that the team is responsible for how it works, and how it organizes its space is part of that. Ideally you want a team to have complete control over their space, with freedom to configure it how they like and reconfigure it at will. Things should be done so it's easy to move things around, because during the project the team will need to change things as the project changes. The purpose-built tables in our Beijing office have handy baskets for power and other cables. An immediate consequence of this is to ditch any kind of modular furniture that requires a facilities group to move more than an inch. Most teams I see use simple tables, and you can certainly go cheap here. The biggest hassle is wires - primarily for power and network access. Ideally you want these underfloor or overhead so that people can easily route wires to the tables, wherever the tables happen to be. The place to spend money on furniture is for good quality chairs. Programmers spend a lot of time sitting, and any physical damage due to poor posture will have a direct effect on the team's productivity - so don't stint here. It may be that some people will want strange chairs, such as balls or kneeling chairs. Do your best to accommodate them. Some people are big fans of tables that can be adjusted between a sitting and standing height, as they find that standing for a while helps with back pain. These are harder to find, but worth looking into if your team members need it. Back pain is a common issue, but everyone's pain (and treatment) is different. You'll need lots of wall space, as agilists love their information radiators. You want plenty of room for story walls, architectural diagrams, whatever people want to stick on the wall. A good bit of this wall space should be whiteboards so people can draw something whenever the mood takes them. Include some wheeled whiteboards. Make sure there's a digital camera around so people can easily record what's on the board. Now that displays are so cheap, consider getting some just for wall displays - this is particularly handy for dynamic displays such as build status. I've seen one team have projectors trained on a wall with various kinds of information displays. The traditional layout is to have people working around clumps of desks. This gives you regular eye contact with the rest of your team. However I've heard many people sing the praises of the UPod. People will occasionally need some private space, so ensure there are one or two small conference rooms available, with telephones. These can be used for privacy or when there's a concern about distraction. A large meeting room that the team can gather in for meetings away from the working space is also handy. I've always been a big proponent of lots of monitor space. Clever software with multiple virtual workspaces is a great feature, but nothing is faster than just moving your eyes. Every workstation should have a couple of 20 inch monitors as a bare minimum. My desk has a pair of 20 inch monitors for my Ubuntu machine and a 25 inch for my mac laptop. I don't think that's at all excessive. Software development is inherently creative, so expect to see lots of baubly distractions. Toys are commonly found around our teams (as Neal Ford says: "every team needs a plastic kangaroo"). There are good cognitive reasons why this is valuable, it's all about keeping the brain stimulated and creative. Similarly do provide easy access to snacks and drinks. This helps support informal, conversational breaks in the team area. It's hard to be creative when you have to pay for awful coffee. If you're working with remote workers, make it easy to set up a video link. Indeed many teams like having permanent video links to any remote workers so you can always maintain that casual video contact. InfoQ summary of things for a team room. William Pietri describes a team room he's used. Bill Wake's gallery of team rooms and charts. Rachel Davies's advice on building an agile environment. Joel Spolsky is perhaps the best illustration for using individual offices rather than a single team room. 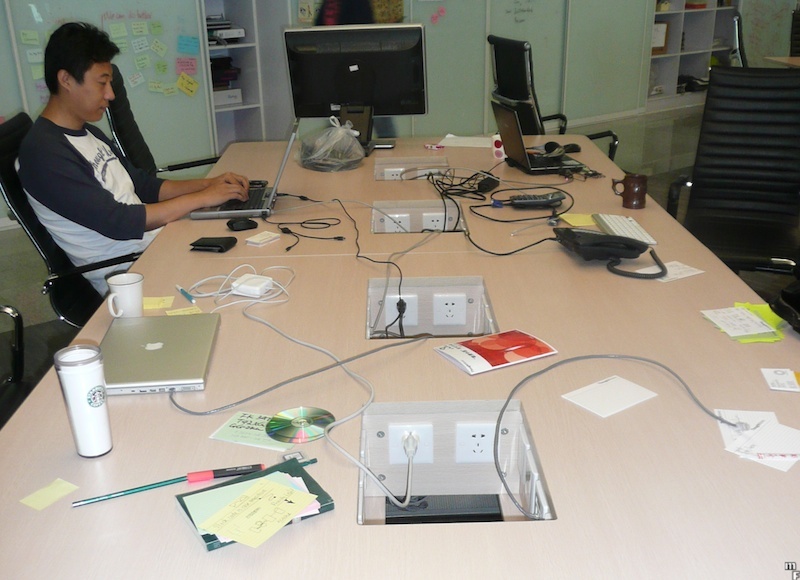 Rajeev Singh's thoughts on moving into this kind of team room at ThoughtWorks India. Photos and discussion of the space at Menlo Innovations. My thanks to my ThoughtWorks colleagues for helping compile this information.